We have refurbished models available of the newly introduced and reliable Xerox Phaser 6600/DN. This color printer has been very popular in Southern Maryland. This model was only lightly used, looks brand new, is fully tested to meet Xerox factory standards and comes with zero meters. 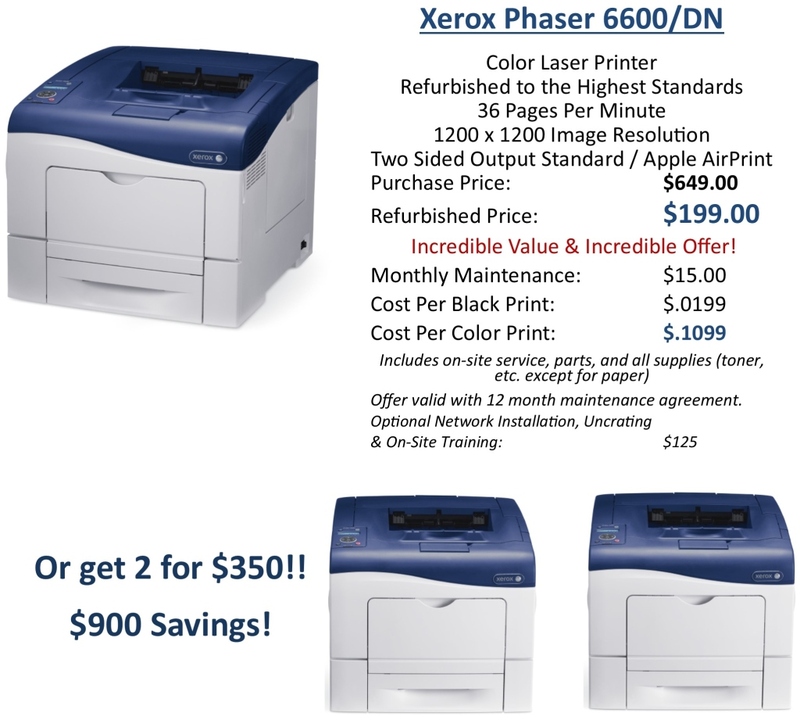 While supplies last, you can obtain a refurbished 6600/DN printer with significantly savings! We began offering the refurbished 6600/DN printers earlier this year and our customers have been very pleased. Our affordable maintenance plans will save you money on your toner and maintenance ongoing expenses! Click here for a comparison of the Xerox 6600/DN to a popular HP model. For more information on the Xerox Phaser 6600/DN and an overview video, click here. Contact us today to order the reliable and affordable Xerox Phaser 6600/DN! Southern Solutions is a technology company based in Southern Maryland, specializing in providing copiers & printers, managed network services, IT support, custom apps and print management solutions to our customers. We cover Charles, Calvert, St. Mary’s and Southern Prince George’s Counties. Through our partnership with Xerox, we directly manage nearly 1,000 printing units in Southern Maryland. We are currently managing over 35 networks in Southern Maryland and providing IT Support to many more. Through our Print Management Solution, we directly fulfill the toner and supplies for over 1.5 million pages produced every month in Southern Maryland.